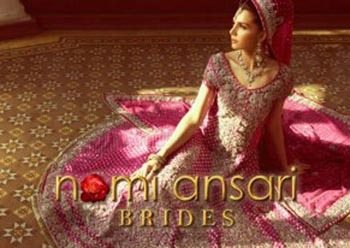 New formal wedding dresses for girls 2017 by Nomi Ansari-wedding collection is all about the such wedding dresses that a young girl wishes to wear on her wedding celebrations. This collection consists of outfits that are traditional yet glamourous and bridal can wear on dholki, mayon, mehndi, baraat and walima days . 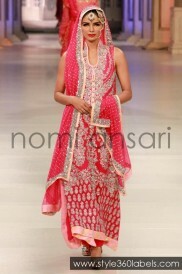 For baraat and walima regal ghararas and anarkali frocks are included in the bridal collection. Nomi Ansari is considered to be the king of colors, mixing, matching, contrasting and blending is his speciality, he uses different colors in an outfit to create a balanced attire. He has changed the Pakistani fashion industry by encouraging ladies to dare for different contrasts. His product line include occassional dresses, bridal dresses, couture, bubbles (kids collection), lawn prints and DNA. This wedding collection is made with fabrics like chiffons, silks, borocades and is embellished with intricate embroidery patterns, stones etc. 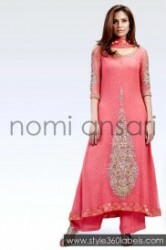 Dresses in the collection have embroidery on neckline, sleeves, daaman and motifs on back. His ready to wear dresses are available at different label stores in Karachi, Lahore and Dubai. For online you can visit his website or Facebook fan page. Here you can see some of his occasional dresses and bridal dresses. Let me know your feedback about the collection in the comment section below.